This entry was posted in Cherry Car, Transit, Waterfront. Bookmark the permalink. I am sure in a pinch a Flexity could become airborne and make it to Cherry Beach. If you really wanted to make it to Cherry Beach I am sure we could enlist some Swans in tugboat service. Tug-swans? All joking aside however I am surprised they never considered a washroom akin to that at Bingham or Neville Loops. The facilities at those locations are rather small and literally just a crapper. I am surprised even that is able to fit in the outbuilding at Bingham. Does Dufferin not have operable washrooms? I know the tower at the loop is out of commission but I figured there would still be an operable washroom. Steve: Yes, Dufferin has a washroom. I asked Brad Ross earlier if Dufferin Loop would remain a fare paid area via the turnstiles and gates (as it has been for decades) or if fares would be paid onboard. Brad stated that streetcars are POP so no crash gates or fareboxes at the loop. This precludes the loop being staffed permanently with a collector. I wonder if the decision not to have a collector at the loop is for safety reasons being so isolated from the rest of the network. That said, with all the traffic during events from the 193, 29 and now the 504 I wonder if they will eventually have the tower operated for events as part of the coordination efforts. Steve: Most of the time there is no need for a paid area at Dufferin Loop, which is even quieter than Exhibition Loop. About six years ago, I walked through the Dufferin Loop in early July. It appeared to be buses only; the streetcar tracks were in bad shape, and I assumed that they would never be used again. I’m happy to have been wrong, but I wonder; was there ever a time, in this century, when the TTC had decided to abandon streetcars on lower Dufferin? Steve: No. The loop is often used as a short turn for 504 King, and sometimes for 501 Queen. It’s most recent problem, a few years ago, came because the track and foundation were so old, built on a less than robust base, and there were some bad road heaves from hot weather. The track has now been rebuilt except for the loop. I hope the TTC finds it within their concept of consideration for their tram-drivers to provide them with a proper loo. Even a “porto-potty” would be better than nothing! Steve: There are many routes longer than the 514 that only have a loo at one end of the line. 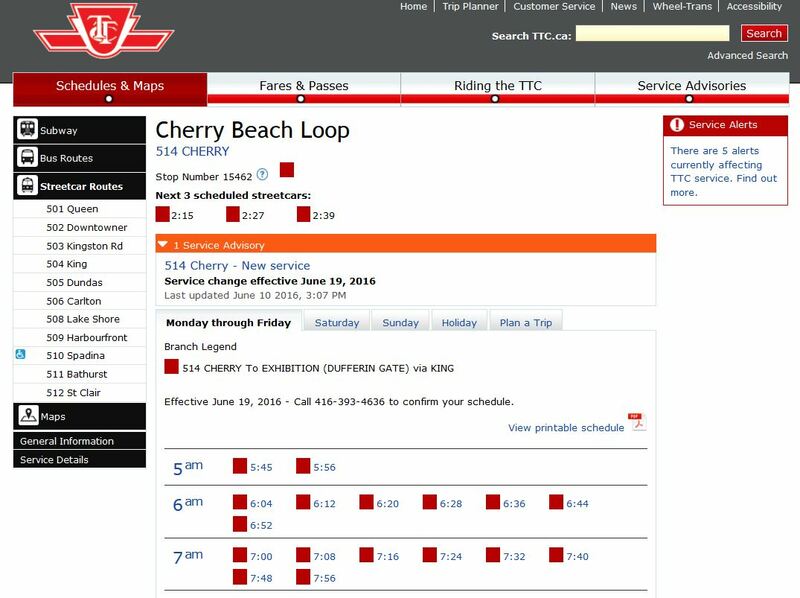 In the inimitable TTC style, there doesn’t appear to be placeholder information in Nextbus for this new route. Unless, of course it magically appears Monday morning. Will the legacy cars have 514 roll signs or will they display a 504 variant? Steve: In theory, the new schedule data should go into NextBus overnight June 18/19. Past experience suggest that this will not happen, but it will be easy to check in less than 12 hours. As for destination signs, there will be window cards in the older cars, and they will probably display 504 Parliament/Dufferin as their destinations according to TTC staff who were on today’s inaugural run. While it’s nice to have more transit, there is now a horrendous hazard for cyclists at Cherry and King with a bike lane being installed atop/through near-parallel-direction streetcar tracks. See @sharkdancing for pics. Having streetcar tracks to cross at 0 to 20 degrees is a sure way to throw some cyclists and in an approved bike lane too. In transit terms, it’s like having a staircase with ridges on a 40 degree slope, and not stairs. The TTC/City are obdurate about avoiding any responsibility for all the track harms, including not really bothering to count how many injuries occur on the main E/W roads, which are already a clear set of hazards to us. It’s not an easy problem to deal with; we like transit, yes, but surely there should be greater worry about how many injuries occur, examined in some ways by Teschke et al to be c. 1/3 of bike-related admissions to some core hospitals. A key goodwill response by the TTC would be total support of a Bloor/Danforth bikeway, in part for its transit relief function, which needs to have continuity first, then concentration. 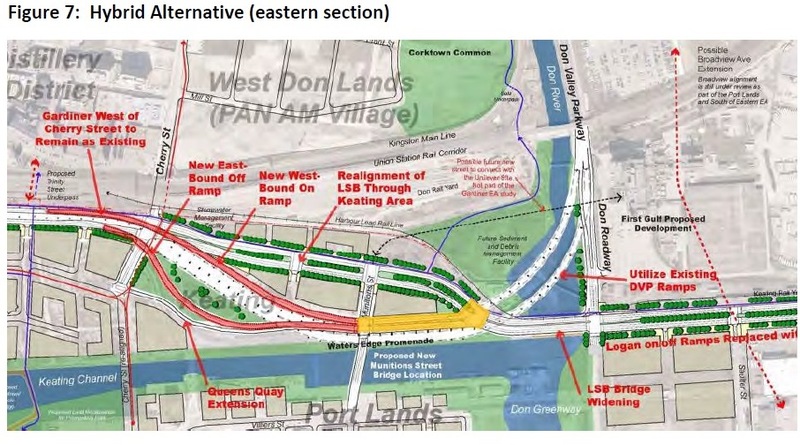 So the Annex pilot is less-smart for this relief idea, and we instead really should have done the bit of Bloor St. E. between Sherbourne and Church from the 2001 Bike Plan, and improve safety west of Ossington on Bloor to DDW. Is there any other more logical place to squeeze motorized traffic a bit than atop a subway?? One thing I’ve been wondering since the idea for the 514 was floated – what does this mean for the future of the 508? King Street seems to pretty well covered, does the TTC plan to ever reactivate the 508? The route page on their site for the 508 seems to have vanished in the last few days, so I assume not. 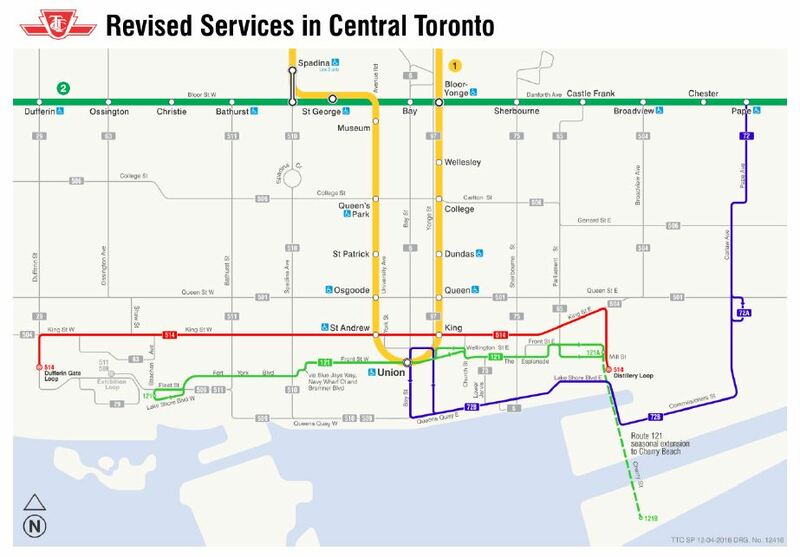 Steve: A roughly equivalent service is provided by some 501 trippers than come into downtown in the AM peak rather than just operating from Long Branch to Humber. Being a cyclist, and having ridden a bike in this city since I was 14. I can honestly say I have never even once had an accident or problem with negotiating the tracks. It seems to me that just like when riding on any road anywhere, you just need to be mindful of your surroundings. Don’t get your wheel to close to the track, this is not hard. The track is very visible. Far too many riders squawk about the dangers of the tracks only because they are to lazy to look where they are riding. If you have that much of an issue with streetcar tracks which have stayed in the same place for the past century, I’m concerned with how you can handle car doors opening at random in rush hour traffic. Or drivers who suddenly stop in bike lanes. Perhaps transit is a better solution. Can we expect anything better than the crappy half-formed non-shelters installed by Transportation in time for opening day? They’re almost as good as nothing. Steve: What is so bad about these is that the City was supposed to have stopped installing these useless shelters. It is particularly ridiculous at Distillery Loop where there is a tiny shelter surrounded by acres of open space. Steve: I don’t use either of these routes regularly, but check in on them via NextBus from time to time. The bunching is quite annoying, and no advertisement for the “improved” service.